As organised retail establishes itself all over a rapidly urbanising India, food and groceries dominate sales in these formats with some urban customers preferring to switch to these comfortable outlets when shopping for their food requirements. A decade ago, shopping for fresh fruits or vegetables in any Indian town or city meant a visit to the daily vegetable market in your locality, while for grains and lentils, it was the traditional Mom & Pop store just across the street from your home. The price was competitive, but neither the vegetable market nor the grocer’s outlet would be a very comfortable or clean place. In 2014, while both the formats continue to exist and thrive across the nation, customers in most medium and large cities now have an additional option while shopping for their food, including fruits and vegetables. These are the airconditioned, relatively well organised and well-stocked and clean and even if it pricier than the street, they are becoming the preferred stop for the Indian middle class which now represents a burgeoning group of people, with an increasing disposable income. The Indian food retail market is estimated to be INR 29700 billion (€370 bn) and growing at over 10 percent a year. 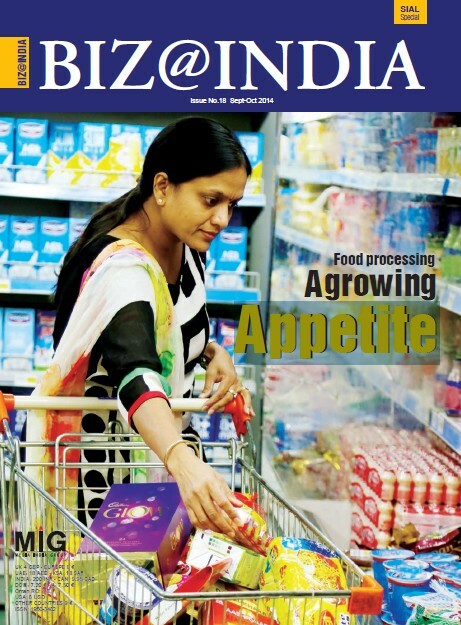 Food & Grocery accounts for about 69pc of the total retail industry in India. The proliferation of organized retailing in India is also altering food consumption patterns, promoting imported foods, branded foods, processed foods, and a wider assortment thereof. A number of players have already established their presence in several cities and towns across the country. 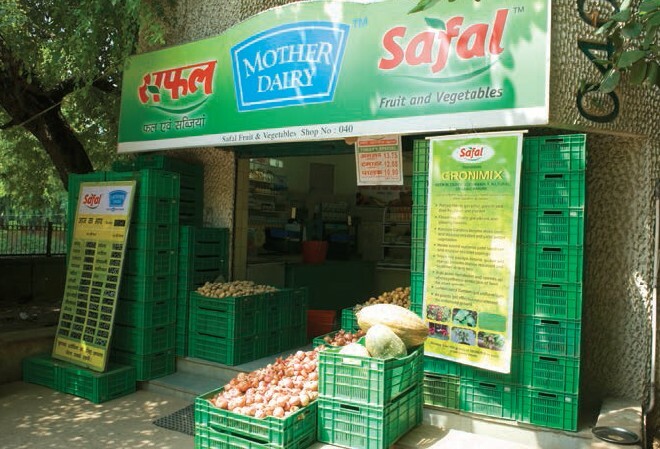 One of the pioneers in organised fruits and vegetable retail was Safal, a unit of Delhi-based Mother Dairy, which having pioneered the concept almost 25 years ago, it currently runs 350 Safal stores. The company says it intends to provide a continuous and reliable supply of fresh produce to its customers, all the year around, without compromising on the core values of safety, freshness, and value for money. 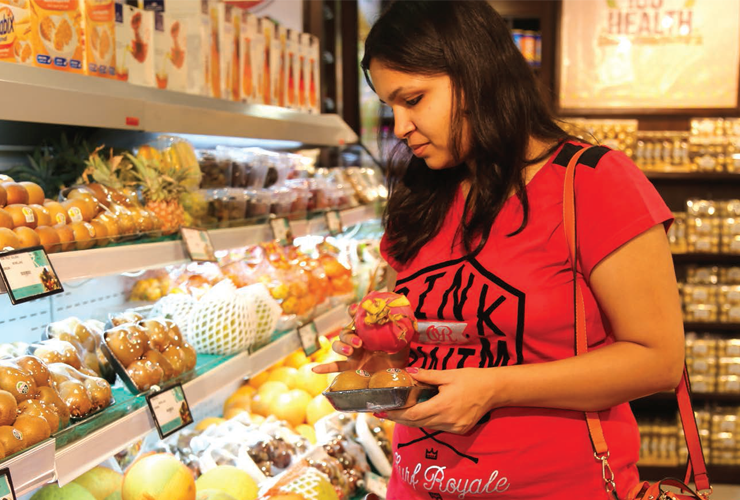 Similarly, Hyderabad-based Heritage Foods has affirmed significant presence in the southern states through 68 Heritage Fresh supermarkets where F&V is the main attraction. Kovai Pazhamudir Nilayam (KPN) is a leading retailer of fruits and vegetables based in Coimbatore, Tamil Nadu. It began its journey in 1965 as a single shop and by 1985 had expanded to four outlets only. However, over the years, it has expanded to become a multi-crore chain of 44 outlets spread across the state. Senthil Natrajan, the Managing Director and son of KPN’s founder N. Natrajan, feels that traditional sellers will always remain their primary competition since they are deeply connected with buyers and know exactly what they are selling, and (mostly) understand quality also. Apart from this, they don’t have rentals or high fixed costs. “Where we can be better is in our ability to provide more variety given the vast space in our outlets, hygienic shopping conditions, and ambient atmosphere, ” he adds. The business model of KPN is very basic and suitable for tier 2 and 3 cities. Its further growth will depend on its capacity for maintaining fresh stocks, competitive pricing, adding products that would entail efficient logistics, and a proper cold chain. There is growing awareness amongst farmers, producers, suppliers, wholesalers, retailers, and even the end-consumers, regarding the benefits of organised play. Organised F&V retail also does away with too many middlemen and hence bringing greater value and profitability to all. “In the traditional model, there can be as many as 2 to 4 intermediaries between the consumer and the farmer. The reforms under the Agriculture Produce Marketing Committee (APMC) Act have enabled retailers to directly procure from farmers in many states. Corporates and chains procure fruits ex-farm for both domestic distribution and exports. For vegetables, however, sourcing is still largely dependent on wholesale mandis,” says a manager of Heritage Foods. KPN has set up a centralised warehouse integrated with the cold chain, and a strong distribution network that is well connected to its outlets. The central warehouse also acts as a collection centre for farmers and agents. Saboro, the fresh fruit retailer, part of Indian conglomerate Mahindra Group, offers a wide range of fresh fruits, including imports. Besides the evolution of the fruits and vegetables market in the physical space, this business has also evolved online, pretty much like the general e-commerce in India, which is booming as well. Several e-tailers like N-Fresh, Blive, Veg on Call, Veggie Bazaar etc. 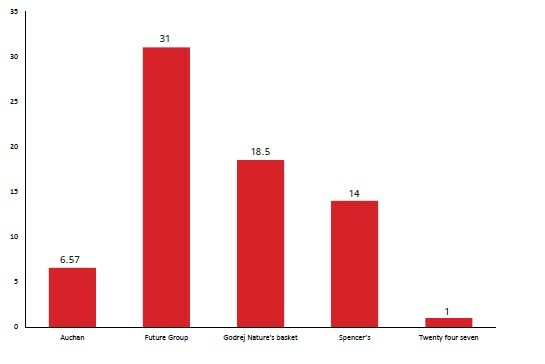 They focus on the ease of online ordering system from home and delivery to the doorstep as their unique selling propositions. Some of them also focus on organic foods or green packagings as their USPs. Though India is the world’s second largest producer of fruits and vegetables, fresh produce worth INR 133 bn (€1.7 bn) is wasted each year due to acute shortage of cold storage and refrigerated transport. To match the growing production levels, capital infusion of over INR 550 bn (€7 bn) is required by 2015-16, which will help in removing supply chain inefficiencies. There are other challenges also. Fragmented supply chain, low market visibility for the producer, lack of clarity regarding consumer requirements, and lack of regulations or enforcement of regulations are some issues peculiar to F&V trade. At the store, grocers have to face logistic costs, high rentals, and other overheads. They also have to deal with problems related to F&V stock such as storage, freshness, and wastage. French hypermarket chain Auchan forayed into India in 2012 via franchising. It has partnered with Bangalore-based Max Hypermarkets India Pvt Ltd, a subsidiary of Landmark Group. The chain has 14 stores across the country generating sales of INR 6576 million (€82 mn) in 2013. 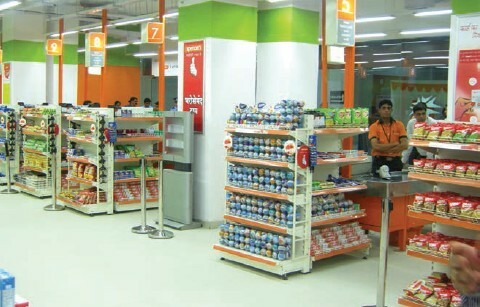 Foodhall by Future Group is a premium lifestyle food store format launched in Mumbai in 2011. Catering to urban Indian consumers having exposure to global food traditions, it operates 6 stores and with a revenue target of about INR 2 bn (€25 mn) by the year 2015. Foodhall outlets offer an assortment of Indian and international foods from fresh produce, dairy and packaged foods, poultry, frozen foods and delis categories. It has recently collaborated with ASA, Copenhagen’s spice specialists and launched Spice Station, which offers a selection of 150 rare and exotic spices and herbs sourced from across the globe. Kishore Biyani-led, Mumbai-based Future Group’s food and grocery business spans multiple retail formats such as hypermarkets, supermarkets, neighbhourhood stores, etc. Presently, the retailer has pan India footprints in over 95 cities through 163 Big Bazaar stores, 186 Food Bazaar outlets, and other formats like KB’s FairPrice, Big Apple, Adhaar, and the newest specialty format store Foodhall. Headquartered in Mumbai, Godrej Nature’s Basket (GNB), a premium gourmet food concept store by Godrej Group, began its journey in 2005. The chain currently has 32 stores in key cities of Mumbai, Pune, Delhi/NCR, Bangalore and Hyderabad. During 2013, the chain registered same store growth of 25 percent and its annual turnover was INR 1857 (€22 mn). Targeting to have at least 10 percent of sales through new products every year, Natures Basket has fine-tuned its product selection approach to make it consumer centric. Nature’s Basket offers e-commerce across stores locations. RP-SG Group owned Spencer’s Retail Ltd operates 128 outlets comprising convenience stores, called Spencer’s and hypermarkets called Spencer’s hyper in 40 cities across India. It has also introduced a new format called Compact Hypers. Spencer’s has widely expanded the gourmet food range in its hypermarkets, especially in metros. It has rolled out an innovative, experiential food retailing concept called Epicuisine in select hypers. These specially designed ‘hubs’ offer quick and healthy ‘on the go’ meal solutions to shoppers. A part of Delhi-based Modi Enterprises, Twenty Four Seven (TFS) is India’s first and only roundthe- clock convenience store chain. Incepted in 2004, it has 38 outlets across Delhi and in key cities of Uttar Pradesh and Haryana. This includes non fuel retailing (NFR) stores under a joint venture with Indian Oil Cooperation (IOC) for north India at IOC petrol pumps. Now, it is eyeing a mega pan India expansion over the next five years. The chain’s annual turnover was INR 1 bn (€20 mn) in 2013.